65 percent of today’s grade school students will go on to work in jobs that haven’t yet been invented. That’s according to Most Likely To Succeed, a new documentary designed to challenge the way we think about education. It argues that the American education system is preparing students for jobs in an economy that no longer exists, and that by focusing so heavily on testing, we’re leaving our children uninspired and unprepared for life after school. 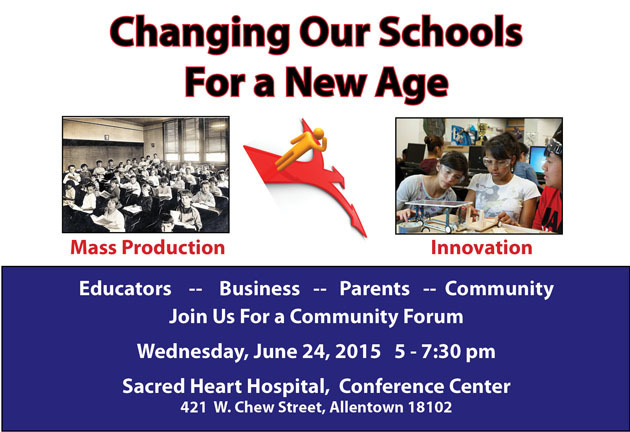 The documentary, which was screened at Sundance this year, will be the centerpiece of “Changing Our Schools for a New Age,” a community forum June 24 in Allentown. In today’s talent-driven economy, where can a truly effective education system take us? What goals must education satisfy to achieve that vision? The quality of local schools can determine where people decide to live. At RenewLV, we’re committed to preserving our core communities, which means attracting people to urban centers with good schools. But this isn’t just a topic for politicians and educators. Parents, students, business owners and community members all need to take part in this discussion. Let your voice be heard at the forum, scheduled for Wednesday, June 24 from 5 p.m. to 7:30 p.m. at the Sacred Heart Hospital conference center, 421 W. Chew St. in Allentown. If you can’t make it Jun. 24, you can catch a screening of the film today at 5:20 p.m. at the Victory Firehouse at 205 Webster St. in Bethlehem, part of the South Side Film Festival.